As we’ve being saying for all along: The people are the power, and united we stand against tyranny. Let us all learn from the example of Bundy’s Ranch to stand up for our rights from the Federal private agency that calls themselves “the people government”. Sovereignty reign period. We do not need to obey to any agency, and so call bureaucracy that the Feds use to have us obey to their lies and coercions. This serves us as an example that all we have is ourselves and no one else. We are very sure that for now on many are going to do their due diligence and find out about their god’s giving rights, because if you do not know your rights, you do not have any. So if you find yourselves in similar situation, even if it is your county sheriff throwing you out of your own home because of taxes, or non- mortgage payments, just bring yourself your neighbors together and stand up strong against them. Do not be embarrassed because far as we are concerned all debts are paid off/prepaid, and you owed nothing. Can you imagine if we do the same thing with GMO, Big Pharma, Chemtrail, NSA, and all the moneybags officials of the Feds in your city? And by the way, do you know what “Go home means? It means sending the Feds to the only place they belong: the ten miles piece of land/territory name District of Columbia (DC). They have no authority beyond that, and this is the law. So what happens in DC stay in DC? We the people of the Republic of the United States of America have little to do with much of what is taking place within that territory, except that they owed us billions of money that it should be giving to us on monetary value like gold or silver, and making sure as well that they keep track of our paper work properly, yes you hear right, the Feds are our employees, not the other way around! Do not confuse U.S.A Corporation (a private entity) with the United States Of America Republic, where the sovereign resides. The people of the Republic govern themselves, but this will be a topic for another day. We are very pleased for the outcome of the Bundy’s Ranch! You go sovereign beings we love you! Did the Feds just back down to an armed popular militia response in Nevada? That certainly seems to be the case from what we are hearing at rancher Cliven Bundy’s property west of Mesquite, Nevada. Federal land managers described “escalating tensions” which led them to release all – 400 or so – cattle rounded up on public land in southern Nevada from Bundy. Bundy had refused to recognize the authority of the land managers. This dispute began back in 1993, when the bureau cited concern for the federally protected tortoise which lived in the region. But other say this is about bizarre “grazing fees” and other issues, as the bureau revoked Bundy’s grazing rights because he stopped paying these “grazing fees”. More recently, Bundy repeatedly promised to “do whatever it takes” to protect his property. After a string of confrontations between his family members and federal agents while they removed cattle, things got a little tense. Republican Nevada Gov. Brian Sandoval criticized the agency for creating “an atmosphere of intimidation.” Protests erupted when supporters came out the ranch. Now the feds have backed down, and Bundy says it was “the citizens of America” that brought the standoff to an end. This statement comes after Bureau of Land Management Chief Neil Kornze said that the weeklong roundup has been called off. “Based on information about conditions on the ground and in consultation with law enforcement, we have made a decision to conclude the cattle gather because of our serious concerns about the safety of employees and members of the public,” Kornze said in an official statement. Hundreds of militia members and armed protesters showed up at corrals outside Mesquite to demand the animals’ return to rancher Cliven Bundy. 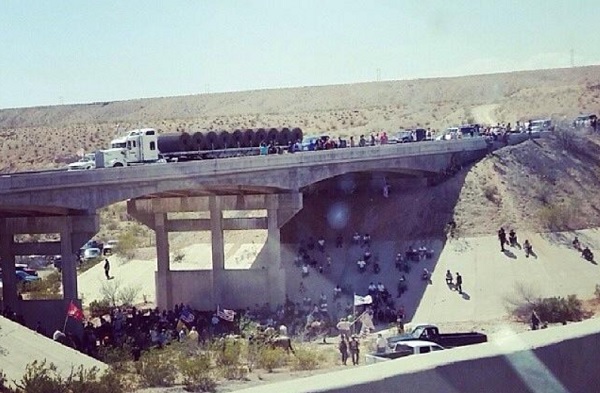 Bundy told local KLAS in Nevada that it was these protesters that forced the standoff to an end. “There is no deal here. The citizens of America and Clark County went and took their cattle. There was no negotiations. 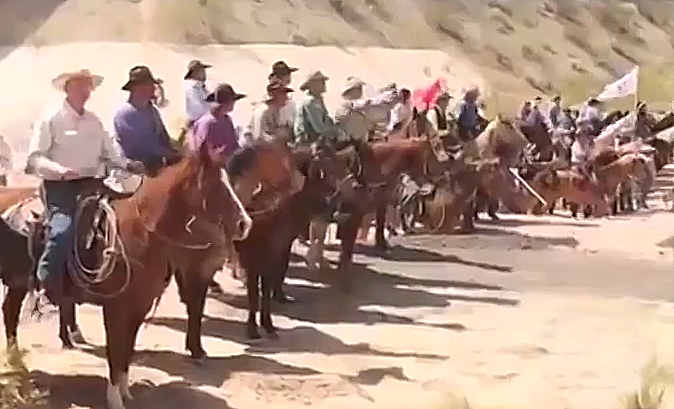 They took these cattle,” Bundy explained. Las Vegas Police Lt. Dan Zehnder told local KLAS reporters that the showdown was resolved with no injuries and no violence. Nevada’s congressional delegation said that now that the stand off is over, protesters should allow the feds to collect their equiptment and leave the area. Thank you Miss Megan for standing up for what is right!